This is a small, uniquely designed facility for those tenants with discriminating tastes. Include cable TV, Wi-Fi, water, garbage, and RV waste. Phone hookups are available. Sorry, we don't take reservations as tenants give only 3 weeks notice prior to departure. Electricity is metered and payable by tenants at the end of each rental period. This is a private, adult only RV park. The campsite shall be occupied and used only as a residence (2 adults maximum), and Camper shall not allow the site to be used by anyone other than the Camper and guests (4 guests maximum) of the Camper. Guests are requested to leave by 10:00 p.m.
Overnight visitors (2 maximum) are permitted for no more than 7 consecutive nights. Recreational vehicles must be 26 feet or longer and not older than 10 years. No converted or non-manufactured RVs are allowed. 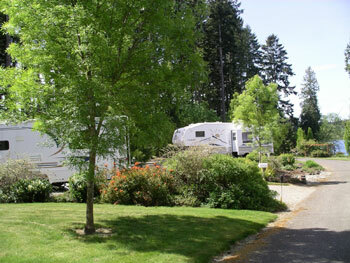 One RV with one vehicle is permitted per campsite. Truck campers, pop-ups or tents are not allowed. Boat moorage is available for tenants only. Shuffleboard, basketball, and volleyball/badminton courts are on site. Swimming beach and dock are provided. This is a non-water skiing lake with a 5 mph speed limit.